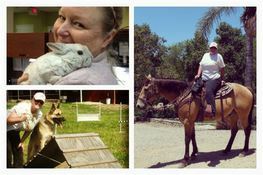 The Ranch is a 501c3 non-profit organization that was formed to offer sanctuary to neglected animals and provide educational experiences to the community. We conduct private tours and special encounters through our outreach programs. Visitors and volunteers interact, help train, and learn proper guardianship skills with our animals. Please see our Programs section for more information. 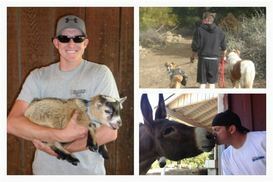 The Ranch has provided a home to many animals that have been rescued, adopted, or donated. Once they have been rehabilitated, they are able to interact with the community for educational purposes. 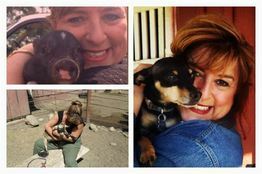 *The Ranch is not a public shelter or adoption agency. The histories of some of our animals are confidential, in order to encourage people make the right decisions for their pets, free from judgment. We always encourage responsible ownership, even if that means admitting that the animal can be better cared for elsewhere. 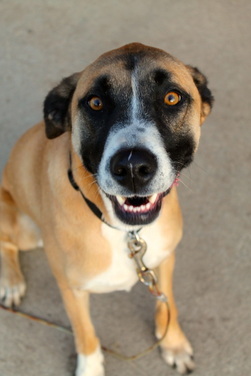 Kate is originally from Los Gatos, Ca; where she grew up enjoying the responsibility and companionship of many animals. With a childhood filled with so many amazing creatures, she was determined early on to dedicate her life to the care of animals. Kate’s ultimate goal is to reduce the number of animals entering the rescue system, through education and exposure; and by proactively offering a safe and educational environment in which people can interact and experience these animals. These services are especially valuable to those who might not have the privilege of experiencing this atmosphere elsewhere. 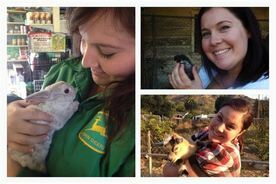 Kate’s animal education began at an early age with plenty of hands on experience. Later in life she began a pet sitting and training business. As time passed, she focused her efforts on rescue work and advocacy. Kate has volunteered and collaborated with various rescue organizations including a wildlife and exotic conservation center. Due to the demands of our organization she is unable to regularly volunteer her time or accept personal clients. However, Kate is committed to providing information and resources for the community to the best of her ability.